This year's Christmas mantle and fireplace. To the right, you'll see my cliche, distressed barnwood ladder. It's an awesome Etsy find and- cliche or not- it makes me happy every time I look at it! Find it below in several color and size selections, available on Amazon Prime! So I'm slightly OBSESSED with these number hooks. I have three sets of them. One here in my entry way, one in my guest bathroom (pictured below) and I also a set outside for pool towels. Best of all, they're also an Amazon Prime item. Quick tip if you purchase these- take the screws it comes with, stick them in some styrofoam, and spray paint black. I love a good cloth napkin just as much as a good dish towel. These black and white buffalo check are a year-round match at my house (I have a lot of black and white accents.) The BEST part about these napkins is that they're wrinkle-proof! Seriously, pull them out of the dryer, fold, and they're ready to go for the next time. NOTE- this price is for a set of TEN! If you want to make this a super special gift, have the corners monogrammed with a single initial. I've had a serious throw blanket addiction for many years now. This is my current fave- Merino Wool Buffalo Check Blanket from Woolly Mammoth. If you do not like the smell of wool, this isn't for you, because it's all wool and wool smells like wool. This blanket is quite large and it keeps you perfectly warm, but not sweaty, as only wool can do. It's the perfect layering blanket for your bed as well- breathable, but keeps the coziness in perfectly. I own these Woolrich Flannel Night Shirts in every color available. They are so comfy and fit true to size to a little roomy. Better yet, the style is a little ambiguous-- is it a night shirt or is it a cute tunic/ dress? I "may" wear as both. If your size or color selection is sold out, look around online-- lots of outdoorsy type companies carry Woolrich products. I think almost every year's Well Styled Mama list has featured some pair of slippers. These are my newest slipper and they're from Vionic. If you're not familiar with this brand, you should be. Vionic makes footwear that have full support in them which is a dream come true for someone, like me, with plantar fasciitis. Since purchasing and wearing these slippers most days, almost all of my PF symptoms have disappeared full time! Worth every penny! I live most of my life in leggings and there just isn't a better, more flattering pair out there than these Active Medium Compression Leggings from Spanx! They are light and give you the perfect amount of smoothing shape without causing any subsequent bulging or weird lines anywhere else. Don't be scared by the "compression" term-- they are just slimming, you won't feel sucked in at all. I found them to be true to size. My newest, favorite find is this Curtis Air Pot. I bought three of these to keep Hot Cocoa Hot and ready to serve a party for 65+ people I hosted this week. You can use these for coffee or any other hot beverage. I made a large batch of cocoa on the stove in my large stock pot and it filled all three of my air pots perfectly. It kept the cocoa amazingly hot ALL NIGHT long! Each one served about 10 large 16 ounce cups of cocoa. Note, these have a glass interior. As other reviewers have noted, be sure to open up all the way and make sure your glass survived the holiday shipping craziness. Out of the three I ordered, one of mine did have broken glass. Amazon was awesome and overnighted me a replacement I had in hand within two days of receiving the broken one. These are SO easy to use and solve such a such a big problem of keeping a large batch of hot drinks going all night! Earlier this year, I found these amazing PinkyUp tea items at my local Kroger grocery store and I've been obsessed every since. This 3PC tea mug allows you to steep a perfect single serving of either bag or loose leaf tea. Check it out in pictures below. I love the red for Christmas and Valentine's Day, but the "Hey There Hot Tea" is my daily, go-to, tea mug! And the spoons below... completely divine! These spoons... they are seriously a must have! Note there are two different sets of these. 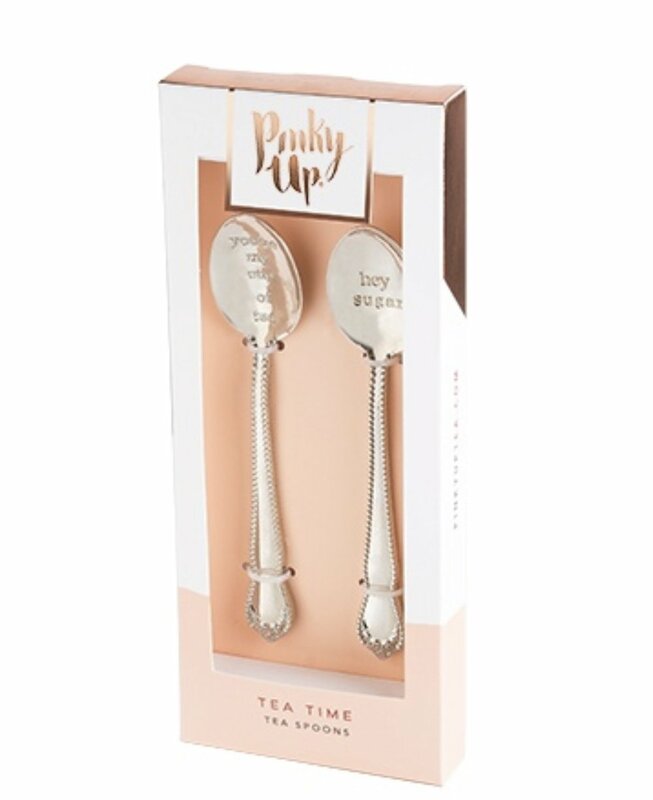 Amazon only has one set available, but both are available at pinkyuptea.com Each spoon in the set of 2 has a different saying: You're my cup of tea, Hey Sugar, Stir things up, Time for tea-- all adorable! So, telling you right off the bat that these bookmarks (and everything else in her Etsy shop) are amazing, but TODAY (December 13, 2017) is the last day to order in time for Christmas-- so hurry on over! I'm ordering these for myself and got Holiday a set for her stocking of all her favorite literary heroines. The below item is from one of my absolute favorite podcasts, The Read Aloud Revival. Even if you don't tune into this one, you will not find a better bag for your books out there. It has been carefully reenforced to carry a HEAVY load. It even has the perfect zippered pocket inside so you don't have to keep looking for your library card. You won't be disappointed! So if you blow your hair out with a blow dryer, you cannot go another day without the Full Pint Dry Bar Brush. It is a game changer... and maybe even a life changer. If you ever lamented that you can't blow dry your hair perfectly like your stylist, it could very well be because you don't yet have this brush. I even had an expensive brush before this came into my life and this one changed everything! Note: this brush comes in three sizes, this particular one has been the best and easiest to maneuver for me. The Full Pint is the medium size-- there's also a Half Pint and a Double Pint.